The edge dewarping software inside the camera and multiple view modes will be freely available from Q2 2015. These panoramic cameras will considerably augment the functionality of any high-end surveillance system especially when coupled with IVA (Intelligent Video Analysis), for example, for people counting or complex rule-based alarm triggering. Panoramic vision and Intelligent Video Analysis The IVA version of the camera uses the latest generation of the Bosch Intelligent Video Analysis (IVA) software. IVA combined with full panoramic vision produces an extremely powerful surveillance tool which enriches full situational awareness. With intelligent tracking, movement can be followed continuously throughout the full image circle. There is no need to hand off tracking from one camera to another, greatly simplifying movement analysis. The system reliably detects, tracks, and analyzes objects, and alerts you when predefined alarms are triggered. A smart set of IVA rules makes complex tasks easy and reduces false alarms to a minimum. IVA also adds sense and structure to your video by adding metadata. Metadata is generated from the full image circle and also separately on the E-PTZ channel. This enables you to quickly retrieve the relevant images from hours of stored video. Metadata can also be used to deliver irrefutable forensic evidence or to optimize business processes based on people counting or crowd density information. Different view modes can be selected for the second channel. Your selection depends on the resolution you require and how you wish to view the dewarped image. The dynamic range of the camera is outstanding and is obvious in real-world performance comparisons — 92 dB wide dynamic range (plus an extra 16 dB when combined with Intelligent Auto Exposure). The actual dynamic range of the camera is measured using Opto-Electronic Conversion Function (OECF) analysis with a standardized test chart based on ISO standards. This method provides more realistic and verifiable results in comparison with the theoretical approximations sometimes used. The camera has a built-in microphone to allow operators to listen in on the monitored area. Audio detection can be used to generate an alarm if needed. If required by local laws, the microphone can be permanently blocked via a secure license key. The low profile of the camera makes it exceedingly suitable for installations where aesthetics are important. Its unobtrusive nature allows it to fit in with architectural features without detracting from the surroundings. Museums, historic buildings or impeccably designed interiors will all benefit from the discreet design. The camera is easily mounted to any surface using a twist-click mechanism via the supplied mounting ring. The high quality IR corrected lens is factory focused and is not restricted by a bubble, so installation is simplified and sharpness is assured. The LED indicators, reset button and SD card slot are easily accessed via two hinges at the front of the camera. A complete set of indoor mounting accessories, such as a surface mount box or a pendant pipe mount, are available. Power for the camera is supplied via a Power-over-Ethernet compliant network cable connection. With this configuration, only a single cable connection is required to view, power, and control the camera. 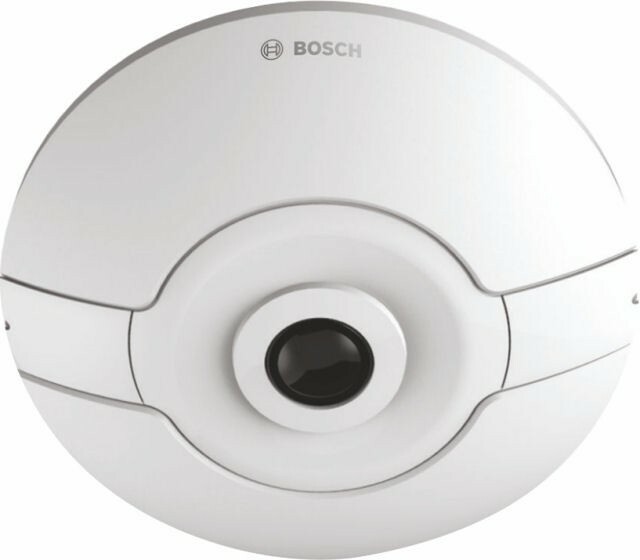 There are many ways to access the camera’s features: using a web browser, with the Bosch Video Management System, with the free-of-charge Bosch Videthird-party software. The Video Security Client has extensive dewarping capabilities and can be used for client-side dewarping as well as for viewing the available modes.